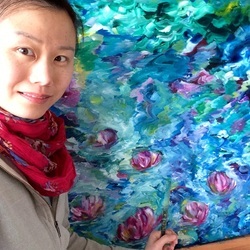 Since Aeris Osborne moved to Canada from Hong Kong in 2007, this beautiful country has been a nursery for her passion for painting. Thanks to her husband, Gary who has been spiritually supporting and encouraging her being a self-taught artist. Most of her paintings were inspired by the most beautiful places in Canada and different elements of the world - from Majestic Rocky Mountains Ranges and architectures to vibrant west coast colours seascapes. Aeris Osborne's favourite mediums are Acrylic, Indian Ink Pen, Pastel Pencils and Watercolour. She enjoys using the paint brushes to glorify God's beautiful creations. If you have any questions or if you are interested in a custom order please contact Aeris Osborne, her artworks is collected in North America & Asia.